The Notwist are a wonderful alternative indie rock-pop-electronic band from Germany. Just recently, allmusic.com led me to discover the various side projects from the members of Notwist. Here is a brief exploration of those projects. Console is a side project for Martin Gretschmann, the lead programmer for Notwist. Console has released 4 electronica albums on various labels. 13 & God was a calaboration of Anticon label members Themselves (Adam “Doseone” Drucker, Jerry “Jel” Logan, Dax Pierson) and Germany’s the Notwist (Markus Acher, Micha Acher, Martin Gretschmann, Martin Messerschmid). They released a self titled album in 2004. Tied & Tickled Trio was formed in 1994 by Notwist members Markus (drums, programming) and Micha Acher (trumpet, upright bass). Their debut features Christoph Brandner on drums as well as serveral other German musicians. The group has been described as a fusion of modern electronic and contemporary jazz. Guitarist Markus Acher is a member of Lali Puna along with vocalist Valerie Trebeljahr and drummer Christoph Brandner (of the Tied & Tickled Trio). The experimental electro-pop group released 3 albums in the 90’s and 00’s. Ms. John Soda is a “part-time” project by Couch keyboardist Stephanie Böhm and Notwist bassist Micha Acher. They’ve released three albums, most recently Notes and the Like in ’06. The usb functionality on my digital camera stopped working recently and I needed a memory card reader for my computer. Luckily there are loads of very cheap memory card readers on eBay. I picked up a little semi-transparent blue SD Card reader for $.89. I got it about a week later and it works just fine right out of the box. Just be careful removing the plastic caps because the plastic is thin and can break easily. The cool thing about little readers like this is that they can be used as a flash drive once you put a memory card in them. Somehow these little gizmos are so cheap that the ebay sellers can afford to ship a “bran-new” gizmo from China to the US for under a buck. Here are some eBay search results. At these prices there’s not much to lose. 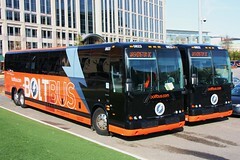 Hey BoltBus, you’re already awesome for having a beautiful fleet of new buses with Wifi and electrical outlets, offering very competitive prices and doing it all with an air of professionalism. You’re my “china-town-bus” sans the violence and poop smell and while your name may not be as charming as Double Happiness, you are clearly my first choice in regional transportation. And now I can buy tickets from my cell phone… nicely done.